Justin Hawkins of The Darkness made a surprise cameo during Sunday night’s Super Bowl broadcast, performing his hit with The Darkness, ‘I Believe in a Thing Called Love’, as people who had been waiting in line for the new iPhone partied to the music with the new Samsung Galaxy Note. Watch it via YouTube below. Former The Darkness frontman Justin Hawkins spoke with The Sun about why he’s joining Beverlei Brown in a bid to represent Britain for Eurovision. “I had a dream that I should do it,” the rehabilitated singer explained. “I think I’d got to the vote and then I woke up. When you’ve enjoyed a long break it’s nice to hit back with something that is as big and as glamorous as they come. It’s my new ambition. Eurovision is something I’ve always wanted to do.” The full story at thesun.co.uk has since been removed. 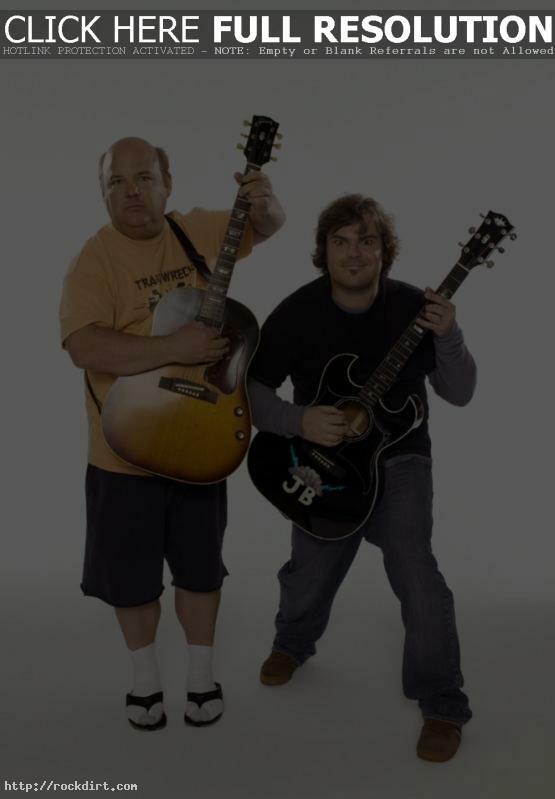 Kyle Gass and Jack Black, Lil’ Chris, and former The Darkness singer Justin Hawkins were on hand for the world premiere of ‘Tenacious D: In The Pick Of Destiny’ held at Vue cinema Leicester Square on November 1st in London, England. Check out pictures from RexFeatures, GettyImages (page1 / page2), and WireImage. Former The Darkness frontman Justin Hawkins attended at the opening of the Natural History Museum Ice Rink on Tuesday (November 14) in London, England. Check out pictures from FilmMagic. Former The Darkness singer Justin Hawkins tells Neil Sean of Sky News he hopes to make a comeback next year at the Brit Awards. “I’m planning a solo career but I may rejoin the band again at some stage,” he said. “We all need some space right now.” Read more. Liverpool Summer Pop featured The Darkness in concert on July 13th at the Big Top in Liverpool, England. Watch several video clips from the gig at YouTube and check out pictures from FilmMagic. Metallica, Hard-Fi, The Darkness, Goldfrapp, Living Things, and Depeche Mode perofrmed at the Heineken ‘Jammin’ Festival in Imola, Italy on June 16-17. Check out pictures from RexFeatures. The Darkness singer Justin Hawkins attended the F1 Party on Wednesday (June 7) in London, England. The event is in its second year and is hosted by Great Ormond Street Hospital Children’s Charity (GOSHCC). Check out pictures from FilmMagic, RexFeatures, GettyImages, and WireImage.